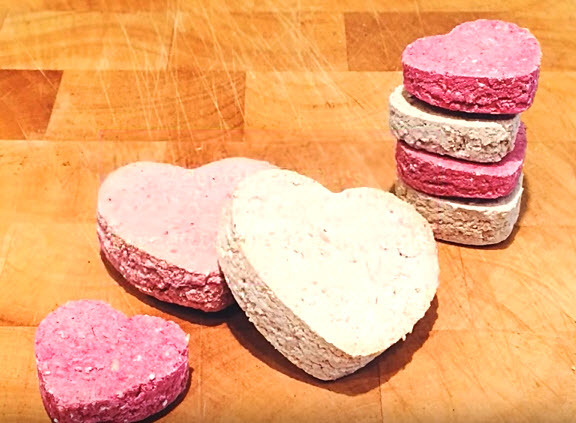 Use beets to color your horse treats for Valentine’s Day! Combine all of the ingredients except the beet juice in a bowl, then knead the ingredients into a dough. Flatten a ball of dough on a counter, then cut out a heart shape from each flattened ball with a knife or cookie cutter. Add some beet juice to the dough, then make more heart-shaped treats. Continue adding beet juice to the dough to get treats of varying shades of pink. Put the treats on an ungreased baking sheet, bake them, then store them in an airtight container.